Like the VeloSolex and the Citroen 2CV, the Derny is a French icon, the designated pacer for cycle racing since the 1920s. This 1956 model, restyled with faired-in headlamp attached to the petrol tank, is the last of the line. The change of headlight style was in response to new lighting regulations for road-bikes. It appeared for only one year before the original Derny ended forever. The model came in two options, ‘Mixte’ – illustrated in the 1956 catalogue, above – and ‘Solo’ which was the men’s model, which is the machine featured here. French taxation laws changed in 1956, meaning there was no longer an exemption for pedal-operated 98cc motorcycles, so the company ceased production. Manufacture of the 125cc Mochet Velocar microcar stopped for the same reason. Efficient new ‘mo-peds’ had appeared at all the 1955 shows, totally dominating the small motorcycle market, and making pedal-operated 98cc machines obsolete overnight. It was the end of a glorious era for these uniquely French machines. The gaudy gold paint is typical of the company’s attempt to appeal to a wider market, which unfortunately failed. As you can see, it needs at least two pairs of hands to operate all the controls. The 98cc Zurcher engine is 1920s style. It is distinctly ‘top-heavy’ with large wheels and an over-sized bicycle frame. The Derny was a total ‘dinosaur’ among motorcycles and mopeds …and the market now demanded the latest sleek motorcycle designs, easy to mount, start and operate. As well as cheap 49cc two-stroke mopeds eating into the lower end of its market, and the Citroen 2CV taking care of the top end, 125cc four-stroke motorcycles (particularly Peugeot’s quality-made machines) had dropped in price to compete head-on with the 98cc two-stroke Derny. Even with its restyled appearance, this cumbersome machine was a relic by 1956, and the change of taxation laws was really just the final nail in the coffin. Of course, within just a few years, even the mopeds that replaced ‘dinosaur’ French motorcycles like the Derny were displaced, by small Japanese four-stroke motorcycles and mopeds that were much more reliable. This machine retains its original gold paint and transfers (decals), including its French dealer plaque: G. Peuziat, 104 Ave de Maine, Paris 14. There’s also a copy of its original ‘carte grise’ showing it was first registered in Paris in 1962. The speedometer reads 245km and my friend believes, from the original condition of this machine, that’s its genuine mileage from new. It’s ready to ride. The Derny is very famous in France. Its design has hardly changed from that of the earliest motorcycles – essentially a bicycle with an engine attached. It’s front-mounted petrol tank is particularly distinctive. 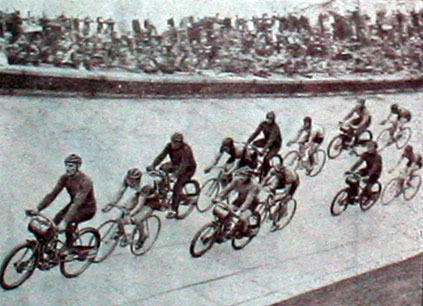 The solo Derny was used for cycle pacing, and its design did not change throughout its production, until the final year of 1956, when it underwent a minor facelift. Its fame is as a result of solo Dernys being used as pacers in cycle racing. In fact, the word ‘derny’ has become a generic term for motorized pacers. The idea of the Derny was designed and constructed by two French ex-racing cyclists under the name Roger Derny and Sons. This was the conventional ‘motos de stayer’ (in the UK, ‘Big Motors’ is the term used today). 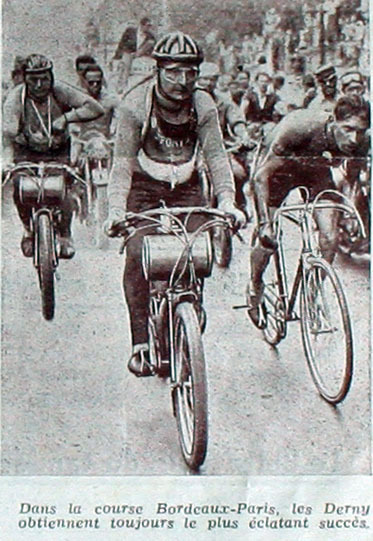 These type of pacing machines used first for the Bordeaux-Paris were not very reliable for road use. So another type of pacing machine had to be designed. As a result the Derny was born and put into production in 1938. The Derny brothers’ first factory was at 81, Avenue St. Mande and later they moved to Avenue du General Bizot, both in the French capital. When the parent factory closed in 1956, Derny machines for the Bordeaux-Paris were maintained and rebuilt by Service Derny of 88, Rue Picpus, Paris until 1974. Derny carried on making other types of machines but closed in 1958. Later on, another type of Derny was re-introduced called a ‘Burdin.’ This machine had many problems: the mobylette engine and the frame were not strong enough for the job. Many manufacturers have tried to change the design over the years but have gone back to the original design because it is still as good today as it was way back in 1938. Pacers today are still called Derny – a fitting tribute to the Derny brothers who first thought the idea up in the first place. Dernys today are made by Arie Simon. He used to make them in Holland, but has now moved his business to Neepelt, Belgium. The Siemon Dernys are used on the road, 6-Days and Keirins by all the pacers on the continent and the UK. They are made of the highest quality.